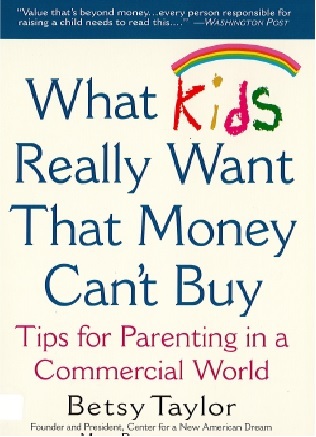 At a time when many parents worry that they are raising the “I want”generation, this book offers a helping hand – and a remarkable dose of the truth. Drawing on the touching, hones words of thousands of children who were asked “What do you want that money can’t buy?” it helps parents peer into their kids’ hearts, hear what really means the most to them, and learn to help them get it. Author Betsy Taylor shows us ways to re-instill a love of life’s simple pleasures, teach the difference between friendships and popularity, build family rituals, appreciate natures, and find quiet time together. 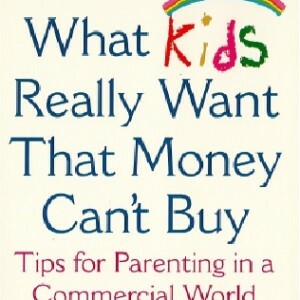 From protecting your children from a billion-dollar-a-year marketing onslaught to allowing them to develop their own spiritual lives, this much needed book is a dynamic, real-world guide to reshaping our busy lives and giving our children more joy with less stuff – and plenty of what truly matters most.